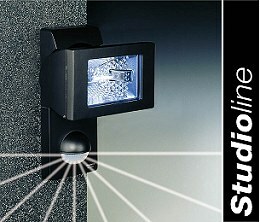 Radiant elegance - This is effective security lighting at its best. The powerful sensor-switched halogen floodlights from STEINEL are exquisitely designed and feature innovative technology. Perfectly integrated, the sensor reliably activates light as and when it's needed. And it's white light too. The blue tinted glass lens filters the warm hues out of the halogen lamp's light spectrum to produce a virtually white light. This the watchful floodlight uses to turn night into day. An effective way not only to frighten off unwanted guests but also to accentuate areas of a property and objects of interest in a spectacular light. The blue tinted glass lens is something quite new in sensor-switched halogen floodlights. 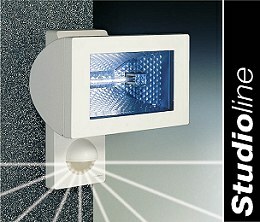 It filters the halogen light to produce a colour temperature similar to that of daylight. The HS 152 XENO is rated for an output of 150 watts maximum. The HS 502 XENO is suitable for halogen lamps up to 500 watts. These floodlights are supplied with mains-voltage linear halogen lamps. The floodlight housing can be turned vertically through 40° and horizontally through 30° to optimise light cone alignment. Reach: Basic setting 1: 12 m max. Basic setting 2: 5 m max.